Senior leaders of both Congress and Bharatiya Janata Party (BJP) have rushed to the state to stitch ties to top regional leaders to form the government. The Indian National Congress which on Sunday emerged as the single largest party in Meghalaya Assembly Elections 2018 staked claimed to form the government. After no single party could reach the majority mark of 30 seats, voters of Meghalaya have elected a hung Assembly, with no single party or pre-poll alliance securing enough seats to be able to form the government. Senior leaders of both Congress and Bharatiya Janata Party (BJP) have rushed to the state to stitch ties to top regional leaders to form the government. A coalition will need to have at least 30 seats in the 60-member Assembly to stake claim to form the government. According to sources, the party wrote a letter to Governor Ganga Prasad to stake the claim on power in the state. Another media report suggested the party leadership met the governor late last night and said they are single largest party to get votes and that they should be invited to form a government at the earliest. Voters had returned a hung assembly in Meghalaya on Saturday. Congress emerged as the single largest party with 21 seats, down from 28 from last assembly polls, Conrad Sangma's National People's Party (NPP) won 19 seats, while UDP managed to secure six seats. With alliances elsewhere in the country and at Centre, NPP and UDP are more likely to join hands with BJP and each other to form a non-Congress government in the state. 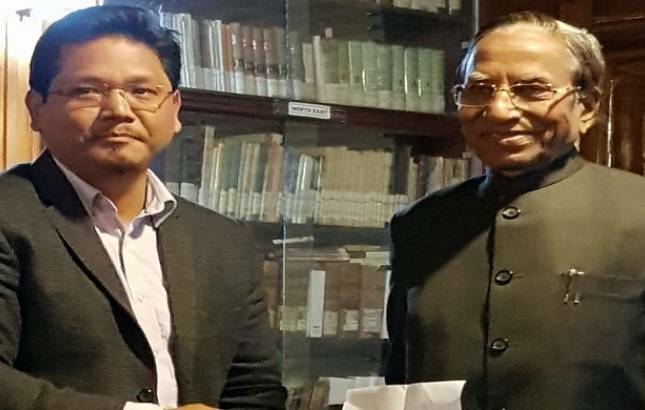 # NPP's Conrad Sangma met Meghalaya Governor to stake claim to form a government. Oath ceremony to take place on 6th March at 10.30 am. # Meanwhile, Tripura BJP chief Biplab Deb says, MLAs of BJP and ally IPFT will meet on March 6 to elect their leader. # Manik Sarkar submitted his resignation as Tripura CM to Governor Tathagata Roy. Sarkar will continue as the CM until the new govt is sworn in.